Engineered for added strength at lower weight, the 6-foot commercial plastic parking block can be carried and installed by a single person. LEED qualified and made from injection-molded, 100 percent recycled HDPE plastic, this parking stop resists tire scuffing and natural elements. The color is molded throughout – there’s no upkeep required. Great for shopping mall parking lots, apartment and condo complexes, and commercial grounds. We can ship right away! Installation hardware available. Pre-Drilled holes. Made of 100% recycled rubber. Will not chip or crack like concrete, nor warp like plastic can. Permanent reflective striping – no painting! Reflective stripes are made of road marking tape. Bonded stripes in yellow. Made from 100% recycled rubber. Rubber conforms to the bumps of the road while causing minimal vehicle damage upon impact. 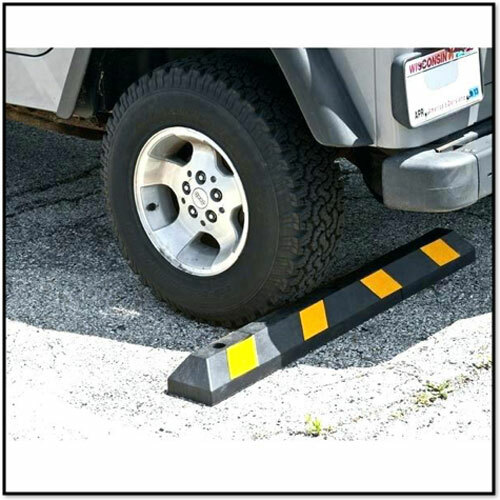 Wheel stop is molded with highway reflective tape to increase visibility and safety. Non-reflective wheel stops, like plastic and concrete, are considered to be tripping hazards for pedestrians. Rubber is a very durable wheelstop material. At 1/10th the weight of a concrete curb, rubber is lightweightand low maintenance. No need to repaint – curbs will not chip, crack, corrode or fade in the sun. Wheel stops feature installation holes on top of the product. Choose lag bolts for concrete installation and rebar spikes for asphalt installation. See below for hardware kits. Each hardware kit can install one 6′ wheel stop. Hardware is included one of our best advantages in the market! 6’ Parking Blocks give also a more professional and safe look to nay parking area, they feature molded reflective tape for high visibility and safety. Commercial ‘Parking blocks are made with high standards and we at Unimat Traffic offers the best prices on the market, we have all of our products in stock and they are ready to be shipped right away, please give us a call and one of our sales representative will be more than happy to assist you! One of Unimat Traffic best seller product is our 6’ Parking Blocks, this product is satisfaction guarantee, the 6’ parking block is a top of the line traffic products, great to be placed in any parking areas, such as: schools, public, parking lots, public parks, private companies, mall parking building, even in private condos and residential areas. Unimat 6’ parking blocks are sturdy and durable and easily to be carried and installed by one person, since they are light weighed just 34 lbs., also this product is very cost effective, it has an excellent durability at a very low cost. We can ship in the complete nation and our products are ready in stock to be sent within a day. Our very resistant Rubber Parking Block is great to be placed on any parking area, just weighing 34 lbs, this parking block is very sturdy, durable and very easily to carry and be installed just by one person. They are made from durable recycled rubber. This parking block will flex slightly to lie flat on uneven or cracked surfaces. they are heavy duty and come with reflective stripes to improve night time visibility. It has 4 mounting holes for permanent installation on asphalt or concrete ground and hardware is included.